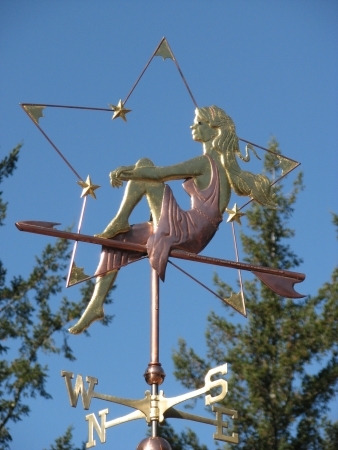 The Star Maiden Weather Vane is very special and it is my very favorite of our weather vane designs. It was commissioned by a wonderful man who came up to our studio to discuss his ideas. This, in and of itself, is a rarity as we hardly ever get a chance to meet our customers in person. 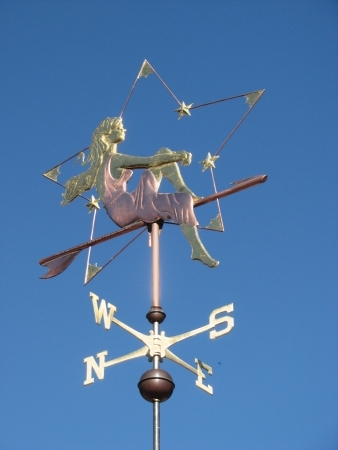 Most of the time we communicate with our customers by phone or email, then ship the completed weathervane out of state or internationally. This process works very well, but it is always a treat to actually meet the person for whom we are making the weathervane. 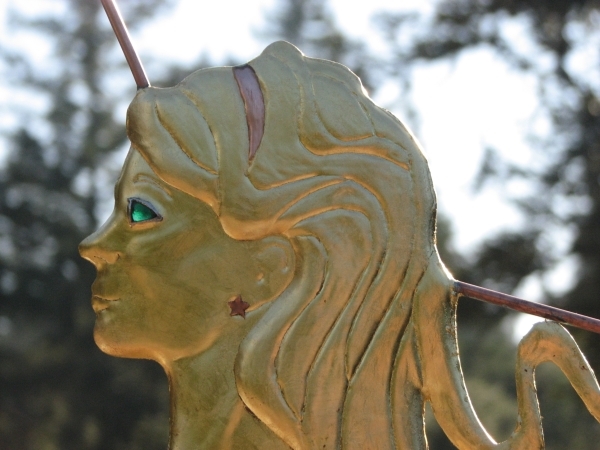 With his permission, I wanted to share the story of how this weathervane came to be. It is a memorial weathervane honoring his wife, who had passed away recently. They first met when she was 17 and they shared 45 very happy years together. 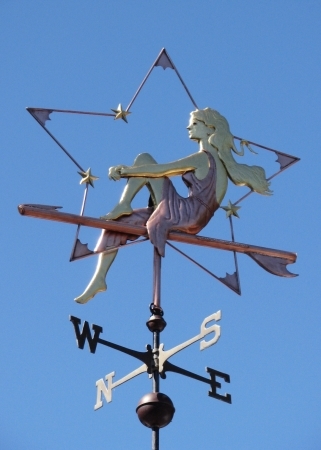 For this special weathervane, he wanted us to try and capture her essence at the time they first met. She had long flowing blond hair, wore long dresses and was very beautiful. He thought our Moon Goddess Weather Vane was close to what he had in mind but it was still not quite right. When we met, he spoke about her shining spirit. He asked us if we could create something that reflected both her inner and outer beauty. Needless to say, this was a tall order and I must admit to feeling a little intimidated when it came time to get started on the design. 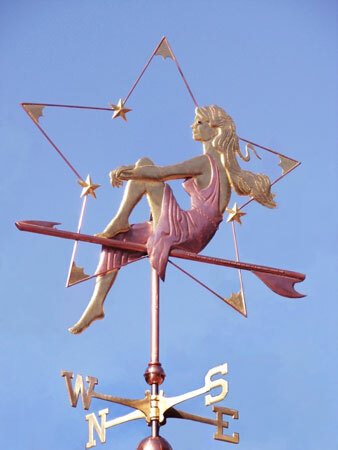 But an interesting thing happened when we went to design this weathervane. Instead of the typical fits and starts that usually accompany the design process, this particular design just seemed to flow from initial conception right through to the final drawing. It was almost as if there was an invisible hand guiding the process. When we presented the drawing to our customer, he said it was perfect! 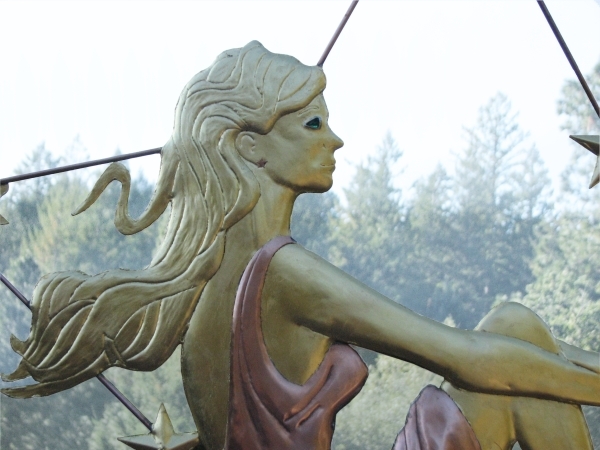 We made his Star Maiden Weathervane with optional gold leaf on her hair, face, arms, legs and on the small stars. She has translucent emerald eyes, a personalized inscription, and several ‘lucky’ pennies that represent years of special significance to the family. Our customer was very happy with the finished weathervane and surprised their sons with it when they came home for the holidays. It is a commemoration for a life well lived that they plan to hand down for generations as a tribute to this special woman in their lives. Creating this weathervane for this family was one of the highlights of our 25 years of making weathervanes. Every now and then we are asked to craft a memorial weathervane in celebration of someone’s life. We realize how much these weathervanes mean to the family and this knowledge informs our process from start to finish. It is a continual surprise to me how often the weathervanes we make for our customers seem to take on a life of their own, each in its own unique way. It has happened enough times over the years that I can now recognize it when it is happening. It is, by far, the very best part of what we do and makes each weathervane unique in a way we had never anticipated when we first began this journey. This particular weathervane, which we have permission to offer to others, is one that will eventually end up in our personal collection as well. 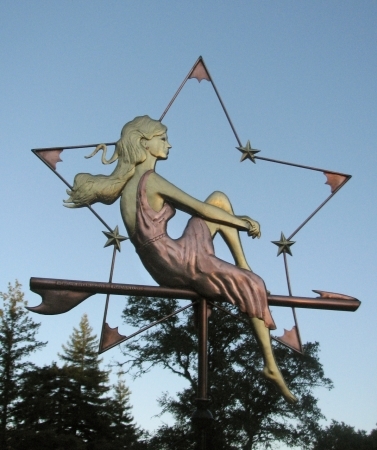 For those of our customers who are looking for a pair of complementary weathervanes, this Star Maiden with one of our Moon Goddess weathervanes would create a really nice visual against the skyline, especially around dusk. In Greek mythology, Asteria is the goddess of the stars and the daughter of Koios and Phoebe. Astraea, the celestial virgin, was the last of the immortals to live with humans during the Golden Age. According to Ovid, Astraea abandoned the earth during the Iron Age and ascended to heaven to become the constellation Virgo. 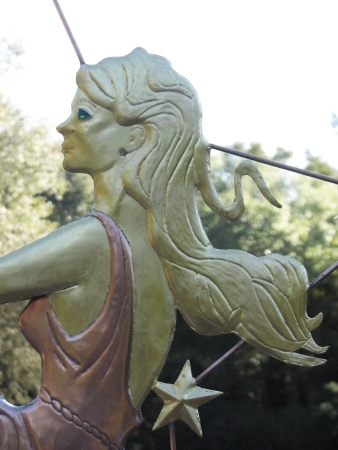 The scales of justice she carried became the nearby constellation Libra. According to legend, Astraea will one day come back to Earth, bringing with her the return of the utopian Golden Age of which she was the ambassador. 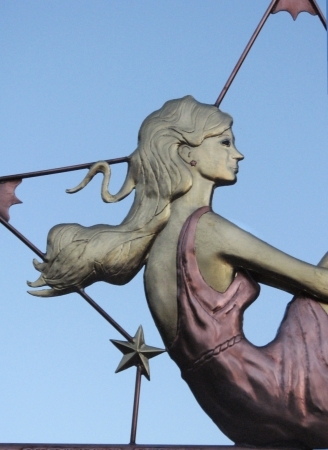 She has come to symbolize Virgo, the Constellation Virgo, and people born between August 23 — September 22. Hence, her popularity as a birthday gift.